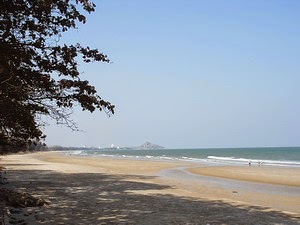 The beach at Hua Hin stretches from the middle of town to the rocky promontory at Khao Takiap. 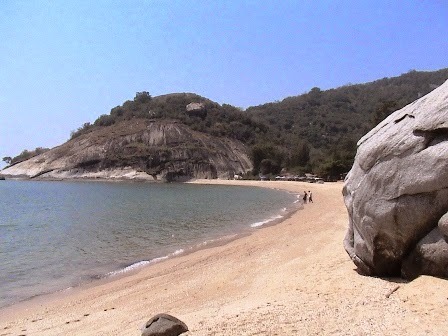 Although there are large rock formations in the water, particularly near the Sofitel, the sea bed is sandy rather than rocky. The strip of sand at Hua Hin is fairly narrow, but there always seems to be space on the sand to spread a towel. Beach umbrellas and deckchairs slung with canvas are available for rent and there are numerous opportunities for activities like jet-sking, para-sailing, horseback riding and riding a banana boat. To the south of Khao Takiap is Takiap Bay, a 5km strip of sand that includes the beaches of Hat Takiap, Suan Son and Khao Tao. 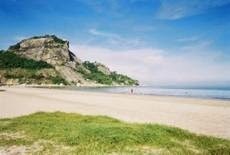 These beaches are more isolated and are fronted by numerous hotels and resorts. 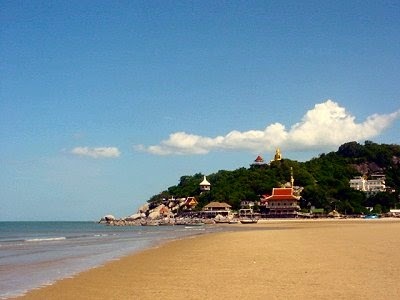 Hat Takiap is the most popular of the three and is easily reached by songthaew from the centre of Hua Hin. It is also the site of a small fleet of fishing boats and a collection of excellent seafood restaurants that offer a choice seafood at a fraction of what it would probably cost you back home. Nice and relaxing Hua Hin beach just 7 km / 4 miles south of the center of Hua Hin on the Gulf of Thailand Coast, from Hua Hin go past the Marriott and Hyatt Regency resorts, beyond Khao Takiab Temple and View point, this beach is around the headland in Takiab Bay and you would miss it if you didn't know about it. In addition to nice beach with clear water there are Elephant Rides, Jet Ski, boats to offshore island, long beac, nice restaurants. Also in the area Off Road all terrain buggy riding, cycling, lots of temples, very nice area. Although Hua hin town is very pleasant many find it more built up than expected and perhaps do not venture away from the center, but Khao Takiab is just 10 minutes from the center of Hua Hin and provides so much more for those seeking a relaxing beach and well priced accommodation, Weekend and vacation houses are many together with a couple of hotels, the Anantasila Resort, Bluewave Hotel, Takiab resort, Seahorse, the new Napalai Hua Hin and other hotels, boutique guesthouses and also budget bungalows and cabins. Just 8 kms away in the South of town, you can view pine tree gardens beside the beach. The beach though is not the same in Khao Takiab but it's wider and very clean. The beach itself is run by Army Welfare Office with pretty gardens and a beach open to the public. You can find cheaper bungalows and small hotels that makes the place more comfy. the beach can get too crowded yet it's peaceful and shady place to stay around... You can find many foods in the entrance. they have small shops for farangs,too. Not to be confused with the island Koh Tao, Khao Tao is a small village around 15km south of Khao Takiab. The biggest attraction here is the delightful little bay and beach at Hat Sai Noi and the large Khao Tao temple complex. To get there turn left off the highway at the sign for Khao Tao, over the railway and turn right before the lake, follow it round and keep to the left at the fork (otherwise you'll end up in the army camp). There is a small sheltered bay at Haad Sai Noi with two or three restaurants serving good food, plenty of seating but does get busy at weekends. Swimming is good as it gets deep quick however jellyfish have been spotted here. The atmosphere at Cha-am is different from Hua Hin. The beach is fronted by a long row of casuarina trees and its is more spread out. It is in fact the longest stretch of sand in all of Thailand. 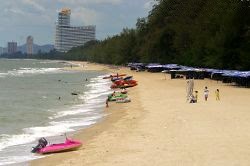 In addition, it is closer to Bangkok, making it popular with Thais who motor in from the Big Mango for a day at the beach or a couple of days in the condo they have purchased in one of high-rises fronting the beach. The Thais love to snack while they play in the water and the beach is chocablok with vendors selling everything from cotton candy to grilled horseshoe crabs. There are also numerous opportunities for watersports, including the inevitable jet-skies, para-sailing and banana boats. There is an abundance of deckchairs and umbrellas for rent and numerous bathhouses where you can use the toilet or wash the sand off with fresh water. Cha-am is not only the home of several large resorts, it is also has numerous small and reasonably priced guesthouses only a few metres from the strand. There is a lot to eat here, but you'll find much less 'foreign' food that in neighbouring Hua Hin. One thing to remember about Cha-am is that it relatively quite on weekdays, crowded on weekends and really packed on public holidays. Although it has a long history, Pranburi is just coming into its own as a tourist attraction. Located 30km to the south of Hua Hin it is quieter, more relaxed and less developed than the better known resorts to the north. It is precisely these qualities that give Pranburi its appeal and it has grown in popularity over the past few years with those who want a little peace and tranquillity while they laze in the sun. 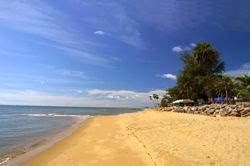 The beach is fronted by a small road that extends south from estuary of the Pranburi river to Khao Sam Roi Yot National Park. Today Pranburi is the home to a growing number of small, but attractive boutique resorts. For those who want to spend time in Hua Hin, several of the Pranburi resorts offer their own transport.